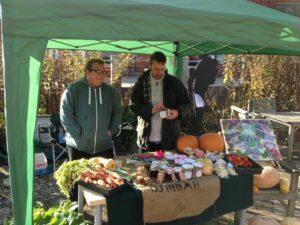 We had all weathers yesterday at our very first Market, The Marketplace at Brogdale Farm – we experienced sun, to rain to sleet! All in one day, definitely the British weather at its finest. But we didn’t let it dampen our spirits! Just look at how happy Terry and Ashley are in our photo! We had a wide range of products for sale, provided by the different sites of Brogdale CIC. We sold some of our fantastic home-made and home-grown products such as our lavender bags, made by students at our Walled Garden site, pumpkins grown at our Brogdale Farm site and jams and cookies made at our very own Food With Friends Café in Ashford. Come along and see us next time. 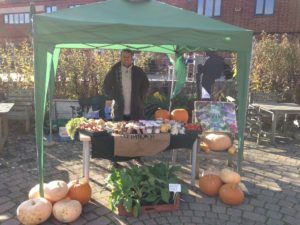 Market days are held on the last Sunday of every month at Brogdale Farm Faversham. All money made goes back into Brogdale CIC to help continue the work we do with learning disabled people.